The drawstring pouch has been a packaging staple for quite some time, and for small businesses on a budget, they can be a life-saver. Gift boxes, jewelry boxes, and retail bags can all be expensive for smaller companies to purchase regularly. Pouches are the perfect cost-friendly alternative to traditional packaging and can be utilized for many types of products. 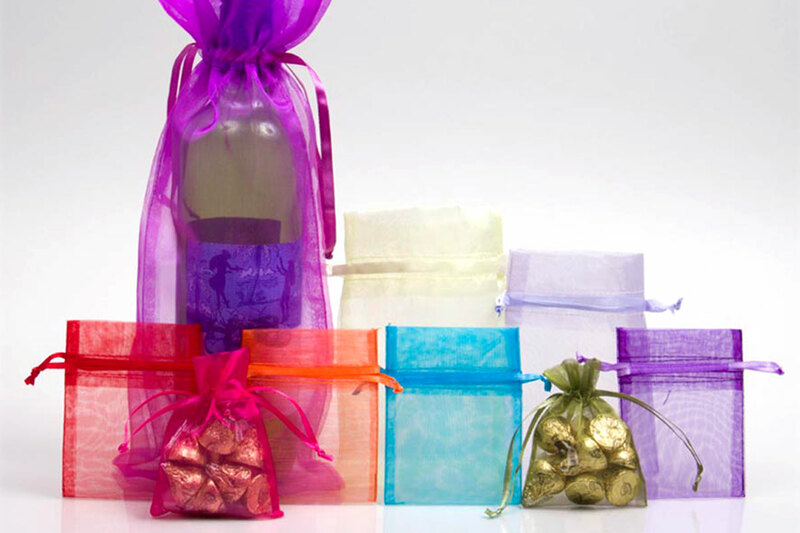 Anything from a tiny pair of earrings to a large candle or wine bottle can be packaged in a drawstring pouch bag. There are many styles of pouch bags available that can replace or enhance your traditional packaging. Anything from sheer organza bags for a fun, colorful look to luxurious satin pouches for delicate items can enhance your retail style. And the best part is, drawstring pouches are reusable so your customers can use them for many other things or for gift packaging of their own! Organza pouches have the widest and most unique color options out of all available pouches. These sheer bags come in 24 unique colors ranging from pastels to classic or bright colors. Because of the huge range of color options, organza pouches are perfect for many different occasions, events, holidays, and everyday retail. These pouches are available in sizes as small as 2″ x 2.5″ and as large as 22″ x 25″. Smaller pouch sizes are perfect for jewelry items, keychains, watches, and small party favors like candy or chocolates. Larger sized pouches can be used for pillar candles, wine bottles, and much more. Because the bags are sheer, your customers and gift recipients get a peek of what’s inside! Playful paw print organza pouches are perfect for pet-related gift items, pet treats, and party favors for events. The best part about organza pouches is that they have included elegant ribbon drawstrings that are color matched to the bags. These drawstrings make packaging simple and quick so you can end with a luxurious gift packaging look with minimal cost and effort. 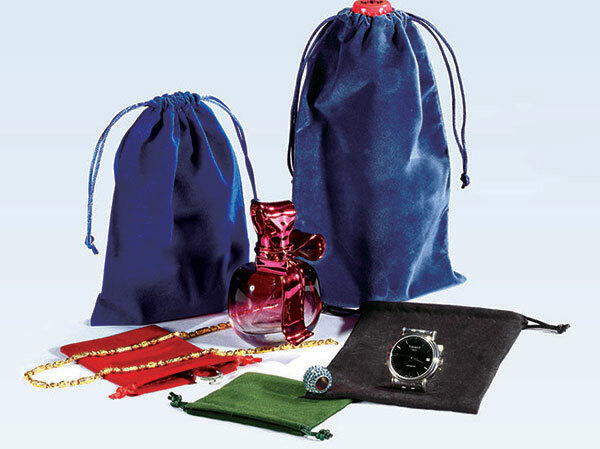 Satin pouches are a luxurious packaging choice for more delicate items like jewelry, perfume, and clothing accessories like sunglasses and scarves. Satin pouches are great for special events and retail, especially specialty gift items. These pouches are available in white and black satin options that are both perfect for special events and luxury retail. 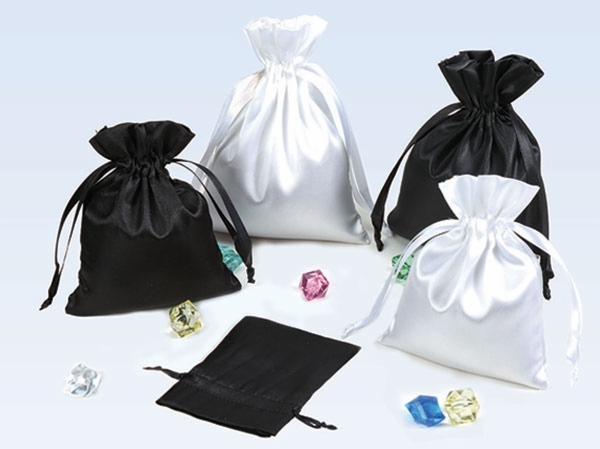 White satin pouches are a beautiful choice for weddings and have matching white ribbon drawstrings for an elegant look. Satin pouches have a silky smooth feel and a beautiful sheen, which makes them exude quality and luxury. The silky soft material also means less risk of scratching or damaging delicate items inside. If you are looking for a more natural packaging option, natural jute and cotton pouches are the perfect solution. 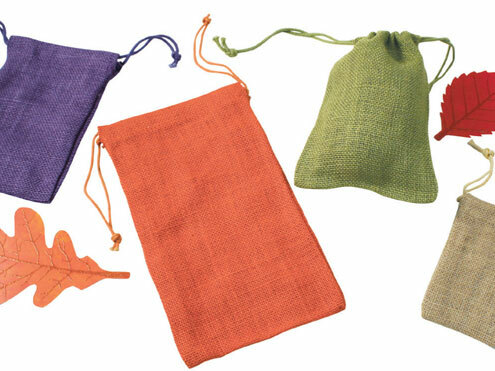 Jute pouches are made with 100% natural jute fiber and come in 4 earthy colors. Cream colored cotton pouches are made with 100% natural cotton making them very eco-friendly. Cotton and jute pouches are perfect for the eco-conscious business or a business who wants a more natural look to their packaging. These pouches have included knotted drawstrings making them extremely easy to use for quick packaging. Multiple sizes are available for a variety of items, allowing you to get creative with your packaging. If you want your pouch gift bags to have a unique texture and feel in your customer or recipient’s hands, velvet and faux suede pouches are just the ticket. These pouches have a luxurious look and feel, to provide a multi-sensory experience. Velvet pouch bags are available in a variety of colors so you can personalize your packaging, and have a classic fuzzy velvet feel. Faux suede pouches are available in black in a variety of sizes, and have a smooth leathery feel (but are not made with real suede). Both of these options are great for jewelry and gift items, while adding an extra sensory element to your packaging. Depending on what you are putting in your drawstring pouch bags, you may want additional packaging items to complete the look. If you are packaging food items in your pouches, you can line the pouches with FDA approved clear plastic bags to provide a layer of food-safe protection. For many other items, you can use tissue paper to wrap items before placing them inside the pouches for extra cushioning. There is a huge selection of tissue paper colors and designs available so you can personalize your packaging for holidays and special occasions. Whatever you choose, we can guarantee that pouch bags are a great packaging option for businesses on a budget.